My drawings of cookies look a lot like diseased testicles. Did everyone have a good 4th of July? I was straight up pooping hot dogs. Because I am a patriot. This comic is pretty minimalist but I like it. I wonder what the next comic will be. How about mouldy meatballs? AMIRGHT!? And yes, I’m pro-minimalist. MOAR! That is SOOOO true about Raisin cookies. Especially if the Raisins are rock hard. 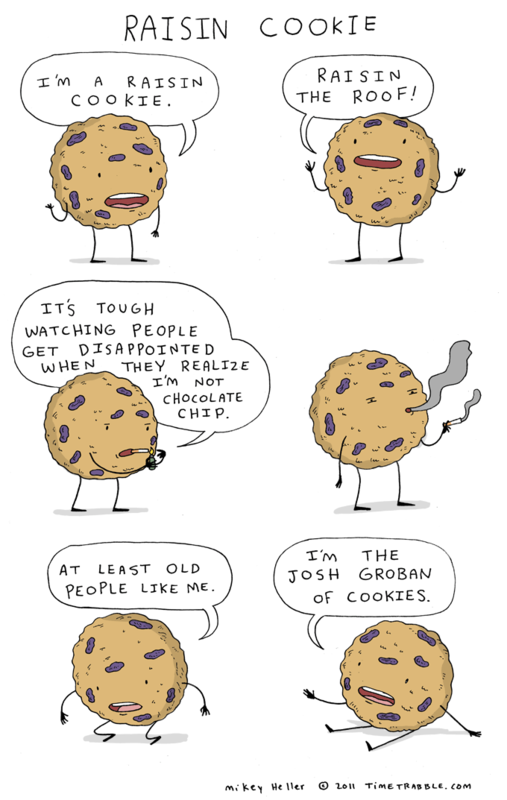 I like raisin cookies and Josh Groban, and I’m not old. I really liked this style, Mikey. Monstrous article! Thanks as a remedy for your article, I scholastic a lot connected with the article, so I know how to do and what is the junk practice to untangle my problems. Looking advance to your auxiliary information.